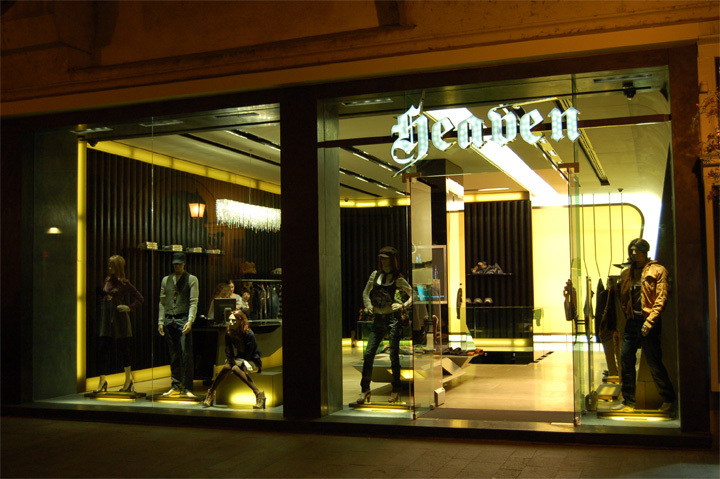 Located in downtown Budapest, the Heaven store was built by our company, Mobilia-Artica Ltd. 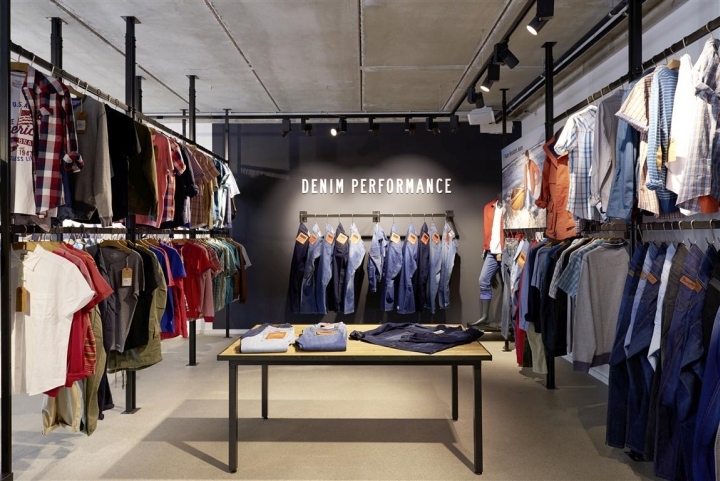 It was a great challenge to create a well-performing multibrand store amongst the many monobrand stores surrounding the location. We have transformed a street store, combining multiple levels. By focusing on transparency and emphasizing on the various ceiling heights, we have managed to create a visually stimulating interior. 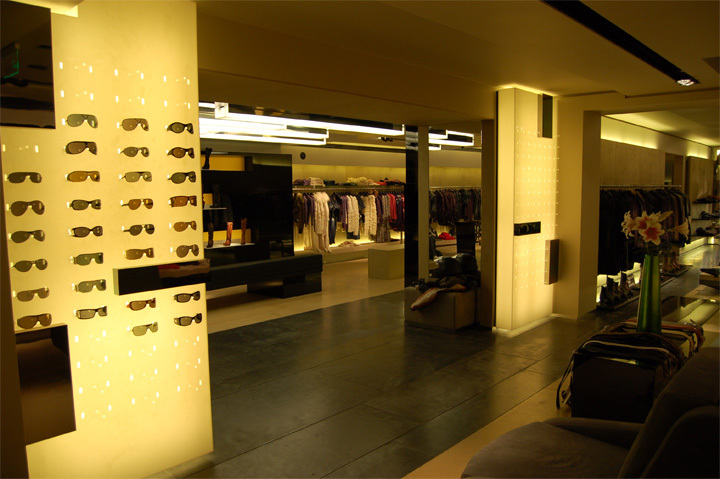 When creating the facade, it was of utmost importance to maximize the visibility of the store interior from the outside. The facade glass material has a spectacular green tint, harmonizing well with the concrete wallcoverings. The facade logo’s discrete shape does not take attention from the store interior, but provides a clear brand identification. 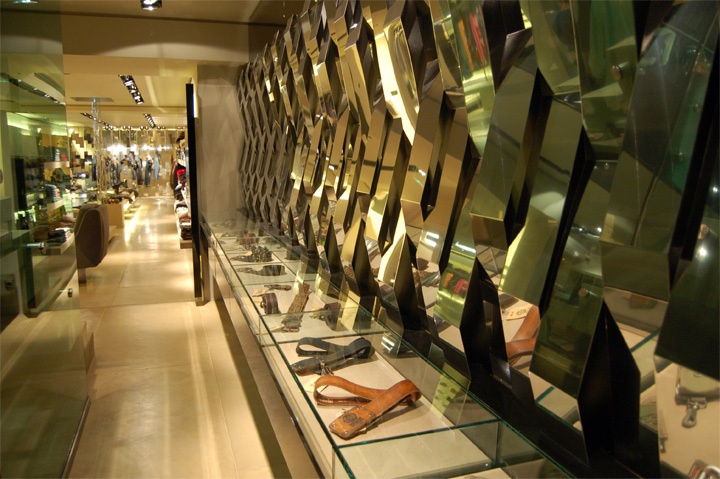 Extraordinary materials and space forms play a vital role in the store concept. The tiles covering the floor and the stairs are custom-made large size concrete sheets. The railing of the staircase rhymes with the green glass of the facade. The suede leather covered ceiling curves down and forms a continuous shape with the wall. The backwall decoration is made of plastic tubes covered with leather, being an unusual interpretation of those materials. Jeans hangers of geometric shapes and lines form a counterpoint of the large, smooth wall. 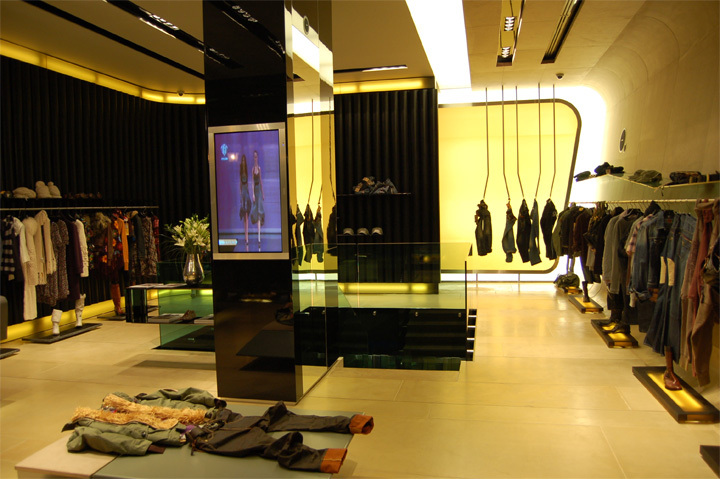 Black highgloss furniture and the backlit accessories walls give the store interior an elegant touch. 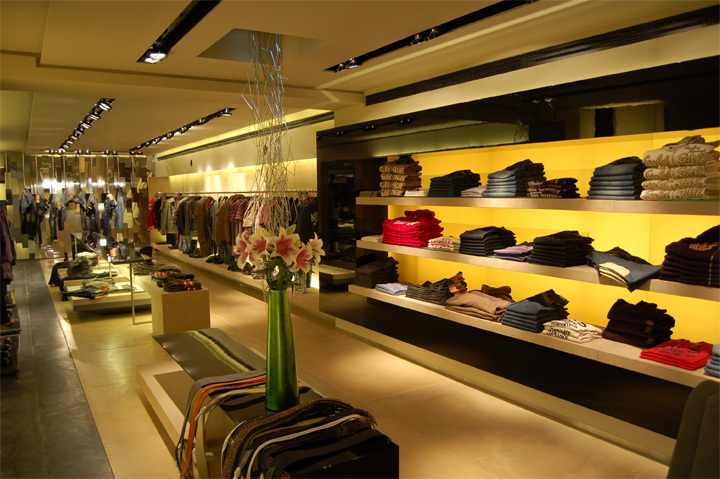 Lighting fixtures hidden in ceiling coves further sophisticate the store interior. 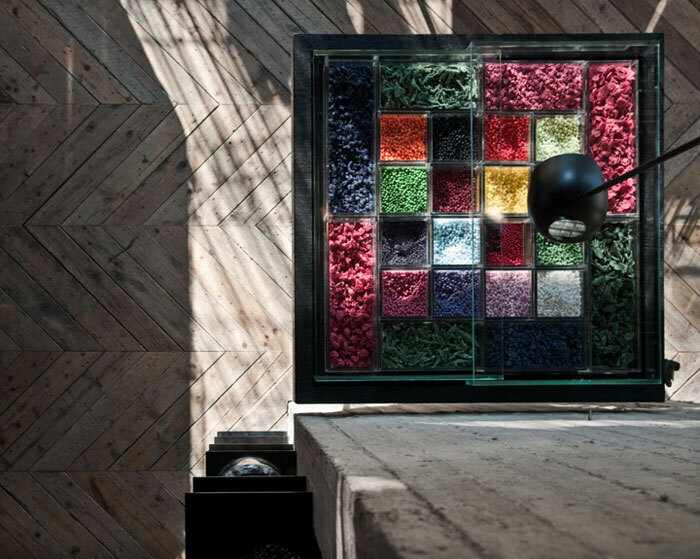 To counter the naturally lower light levels of the basement, the materials used on that level are brighter and have a glossy finish, just like the decorative wall made out of bent metal sheets on a black background. 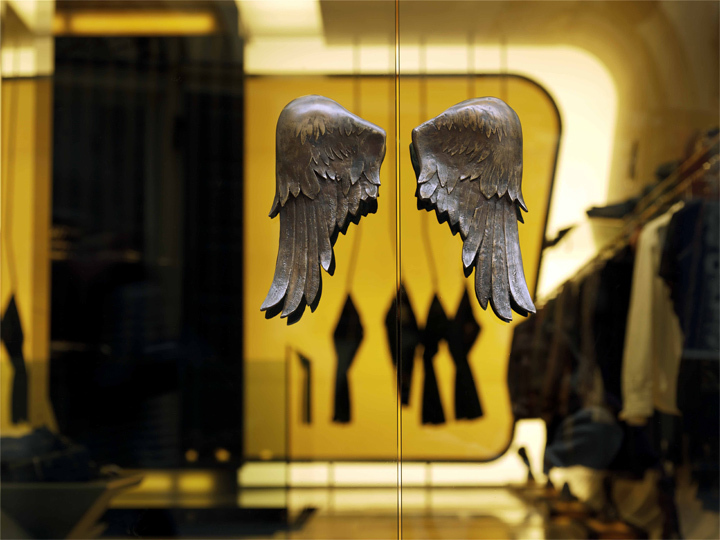 A delicate mix of raw, elegant and glossy materials provides a world class experience to customers, browsing the collections of international exclusive brands placed spaciously and nonchalantly in the store.